29 inches high, 21 inches wide and 2 inches thick (70 x 52 x 5 centimeters). Includes a shock-cord plastic pipe toe board that reaches to the wall. Includes a power transformer for a 110 volt outlet. Includes wall mounting screws on a pre-measured string. Includes three sets of soft-tip darts. 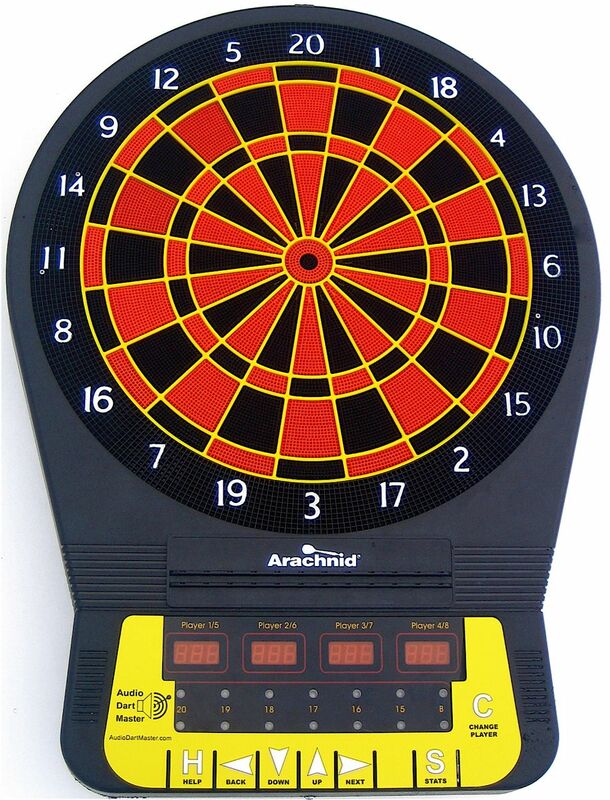 Who uses a talking dart board? Blind and visually impaired people who want to play an active game. People who like to play darts, but don't know the rules or scoring. Schools for the blind and visually impaired. Dart Leagues who may have some members with visual disabilities. People who would like a game that is more fun than a circle of cork on the wall. Tactile front panel with large symbols. Speaks every action and everything displayed in a human voice. Help key explains every option and game. Contains a spoken instruction manual and rules for every game. Games and options to make playing fun for beginners and experts. Easy 4-key menu interface for all options. Back off (un-throw) dart feature corrects mistakes. League option calls when a player is blocked. Calls 'inside' and 'outside' for hits to the two singles rings. 25 or 50 point double bull's eye option. Optional 'clock position' called if you don't have the positions of the numbers memorized. Optional stereo 'ping' or 'click' helps blind players aim. External speaker jack for loud speakers or communication aids. Allows the dart board to be used without putting screws in the wall. Includes a toe board on a folding frame attached to the stand. Disassembles for easy storage or transportation. you can adapt the toe board that comes with the stand or buy this one. Put a message of your choice on the dart board when the power is turned on. Also include spoken names for up to eight people. Check -We will ship after the check clears. Audio Dart Leagues If you are interested in being in an audio dart league, there are several around the country. 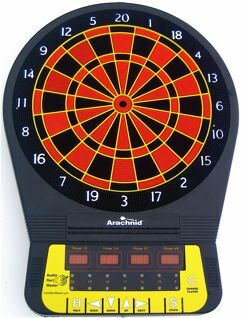 This is the first dart board built for people with visual impairments since Audio English Mark Darts twenty years ago.